It’s probably no surprise that I really enjoyed The Social Network, the partially-fictional tale of how Facebook came to dominate the lives of hundreds of millions of people around the world. And so, also not surprisingly, I’m delighted to see it in the running for Best Motion Picture of the Year in this week’s Oscar race. But truly, The Social Network is one of the best movies of 2010, without a doubt. And not just because I’m ridiculously obsessed with Facebook. 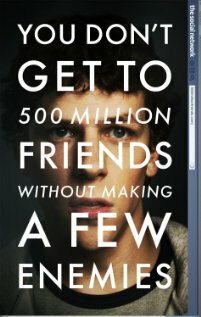 Sure, Jesse Eisenberg was great as the character inspired by Facebook founder Mark Zuckerberg. He was nominated for Best Actor, which is a well-deserved compliment, but I will be sorely disappointed if he actually beats out Christian Bale (The Fighter or Colin Firth (The King’s Speech) for the Oscar. And yes, the writing by Aaron Sorkin (perhaps best known for the television series The West Wing) was brilliant, with fantastic dialogue full of witty banter. The fact that it was loosely based on actual accounts of Facebook’s founding, with the open admission that lots of it was written purely for narrative value with a flair for the dramatic, at least sets proper expectations. But really, this movie is great because of how beautifully the pieces fit together. It’s truly greater than the sum of its individual components – the fascinating semi-history of Facebook, the excellent writing, and the always-good-and-sometimes-great performances by the actors, all combine for a terrifically entertaining film. The Social Network is wonderfully put together, and is a solid contender for Best Picture. It may not be as flashy or creative as some of its competition, but it was one of the first movies of 2010 to really “wow” me, and set the bar pretty high for the year. In fact, I think I’m going to watch it on TV before Oscar Night, just to enjoy it again. This entry was posted on Thursday, February 24th, 2011 at 10:59 pm and is filed under Uncategorized. You can follow any responses to this entry through the RSS 2.0 feed. You can leave a response, or trackback from your own site.